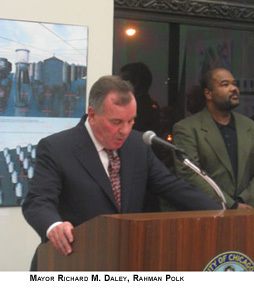 Mayor Richard M. Daley jump-starts a Chicago architectural competition that seeks to locate the city's soul in its historic water tanks. A new exhibition displays 167 of the entries and examines the water tank's history and future possibilities in a high-tech age. 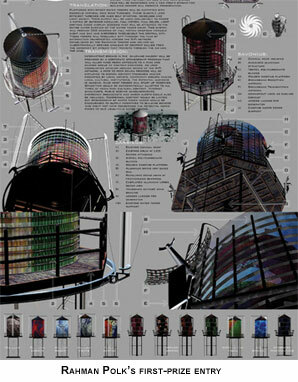 Everyone sees these water towers but most people don't notice them, said Rahman Polk of Hammond Beeby Rupert Ainge, the $3,500 first prize winner of the Chicago Architectural Club's recent competition to find new uses for Chicago's water tanks. 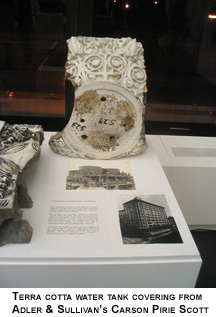 Rahman spoke at the opening of a new exhibition, handsomely mounted by Nathan Mason, at the Chicago Cultural Center that puts 167 of the competition's entries on display, along with an array of other objects that recount the role of the water tank in the city's history. 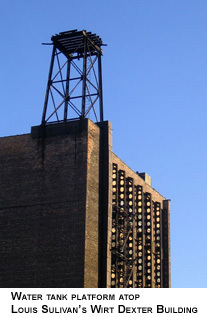 They still cling to the rooftops to countless Chicago buildings, cryptic presences channeling between utility and remnant, grunge and the picturesque. In 1930's, metal began to replace wood as the material of choice, but by the 1980's, mechanized pumps had run the water tank out of general production. Draining a water tank is sowing the seed of its destruction. As long as there's water in it, explains Chicago architect Sam Marts, it maintains the pressure that keeps the tank together. As long as the wood keeps wet, it doesn't rot. Once a tank is emptied, however, boards become loose, and weather and insects expedite decay. About 130 water tanks remain in use today, and even where they've been dismantled, the tall platforms that supported them often still stand, now forlornly incomplete. Because they're tied in to the roof, removing them would require tearing up and restoring the waterproofing, an expensive proposition. At the opening, Brian Vitale talked about the competition's genesis. It really started, said Vitale, with a call that I made with my co-president Robert Benson to the mayor's office to see if there any architectural issues that were needing to be dealt with in the city that we could lend a hand with. Roughly eight months later, we were standing in a room with this year's Pritzker prize winning Thom Mayne, of Morphosis, who chaired the competition's jury. When I first learned of the competition, I thought it was the stupidest thing I had ever heard. It's hard not to think that there aren't a host of urban challenges that would have put all that effort to far better use. But walking into the reconstructed Adler & Sullivan's 1895 Stock Exchange Trading room at the Art Institute was like falling into Samuel F. B. Morse's Gallery of the Louvre. Nearly 200 boards lined the walls in two stacked rows, a profusion of creativity so tightly packed it made the huge room seem claustrophobic. Many of the best entries tap into the way the romance of the city, its latent, sensual intimation of promise and possibility, can subdue the grubby, harsh reality of isolation and loneliness. Water Tanks: The Chicago Prize Competition is on display in the Chicago Rooms of the Chicago Cultural Center, 78 East Washington, through January 29, 2006. Postscript - July, 2006. Another exhibition of the entries to this competition is on display at the Chicago Center for Green Technology, 445 North Sacramento Boulevard, from July 15th through August 31, , 2006. © Copyright 2005 Lynn Becker All rights reserved.